Sarah Hanson / Baku Magazine, Formula1 Sport Special, June 2016 from Sarah Hanson on Vimeo. London-based illustrator Sarah Hanson has worked on perfecting her collage illustration for nearly a decade. Combining traditional with digital techniques, Sarah uses everything from photographs and maps to old paper and objects that she has found and stored over the years, creating captivating images that work just as well for advertising and editorials as they do for publishing and design. 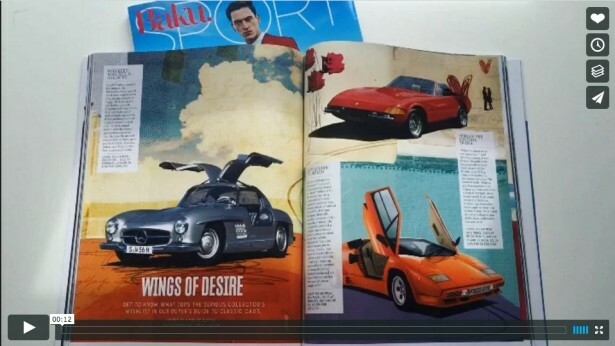 Lately, Sarah’s work showed up in Baku Magazine’s Formula 1 Sport Special edition, where her illustrations portrayed a wide array of motorized vehicles in the “Buyer’s Guide to Classic Cars”.